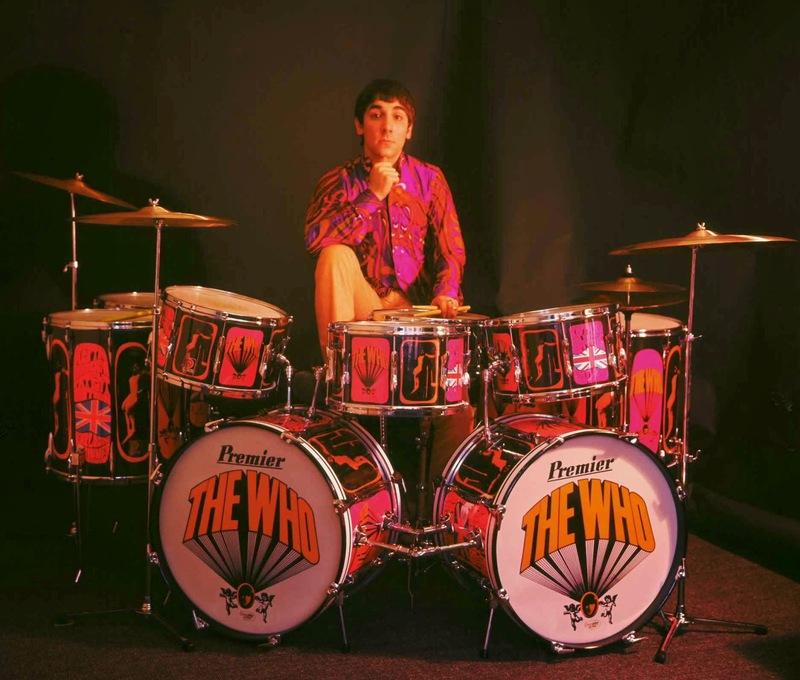 As recognizable as the flamboyant drummer himself, Who drummer Keith Moon's custom Premier drum kit, often referred to as the 'Pictures of Lily' kit is the focus of 'Tools of the Trade' today in the 'rock room'. Moon's drum set ups and specifications were as particular and peculiar as Moon himself. He was often as interested in the aesthetics and destructive capabilities of the drums as well as their ability to disseminate his unique brand of playing. 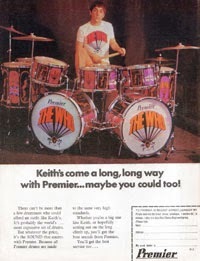 Premier Drums were the manufacturer and the company that Moon often returned to for his kits. 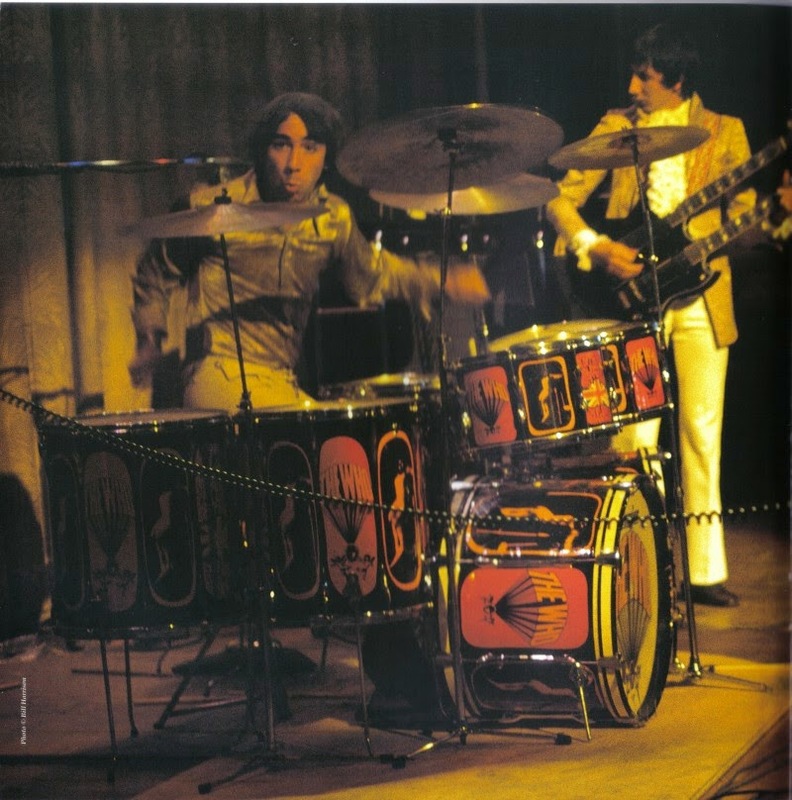 The 'Lily' drum set was used by Moon from mid 1967 through the end of 1968. The Who's performance in December of 1968 at the Rolling Stones 'Rock and Roll Circus' show Moon no longer using the drums so I will use that performance as a cut off point. It's been reported that the first appearance of the drums came in July of 1967 when Moon first received them during the Who's US tour. The drums took six months to create to Moon's specifications and contained many unique features. Who lighting manger and friend John Wofff helped to design the drums and bring Moon's imagery to reality. Everything down to the smallest piece of hardware was developed and ruminated upon by Moon. The first interesting detail about the kit is that it was completely hooked together as one unit. Each individual drum was attached and the double kick drums were outfitted with the ability to be attached to the stage floor due to Moon's hyperactive rudiments and penchant for destruction. Unfortunately and reportedly none of the originally created kits exist in their complete form due to Moon's explosive stage antics. Although many of Moon's acquaintances report Moon's drum detonations were well planned out and never really destroyed anything but hardware. Reportedly four kits were originally developed by the company for Moon. 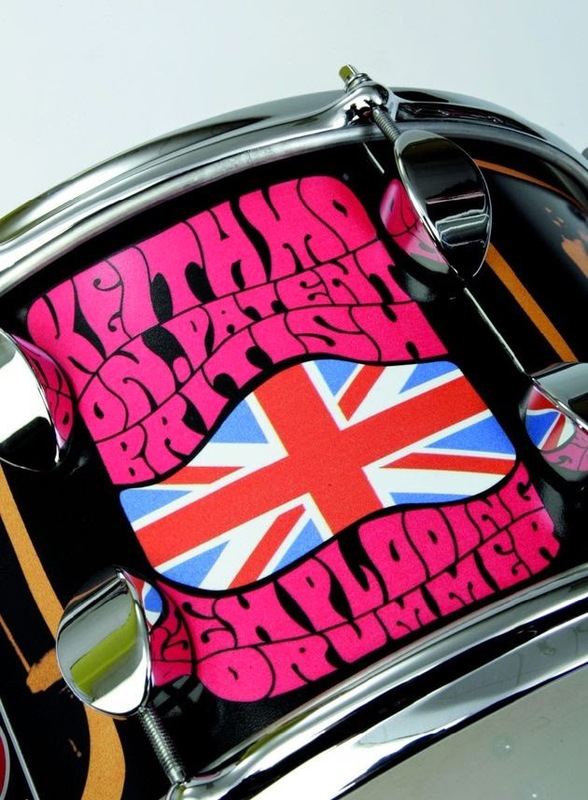 The second fascinating detail about the drums and their defining characteristic are the specially commissioned pop art panels requested by Moon that decorate the kits shells. Psychedelically painted 'Pictures of Lily' as well as 'Who' emblems adorn the outside of the kit. The finest and greatest of these panels contain the moniker, 'Keith Moon Patent British Exploding Drummer' in typical Moon self promoting fashion! The skins covering both bass drums featured the 'Who' logo flying in three dimensional glory and emanating from a head shot of Moon. The kit was of course subject to change depending on Moon's needs but its original format contained (2) 22' Bass drums, (3) Floor Toms, (3) mounted Toms and a snare drum. As Moon grew older and his demands greater his drums would grow to extravagant sizes, but this set, his most recognizable offered him a fluid movement as well as a flashy instrument to fully compete with his guitar player's on stage antics. Moon's crash cymbals were situated on either side of him in performance with a single ride cymbal sitting at twelve o'clock. His high hat would nestle to the right of the kit in contrast to other drummers (if he used it). In the heat of battle Moon would alternate between the crash cymbals at three and nine o'clock while eliciting a stampeding herd of beasts with his double bass drum feet. Included at the bottom of this 'rock room' rant is the complete footage of the Who on the Smothers Brothers show in 1967, that features Moon miming with the Lilly set as well as detonating it with a bass drum packed with explosives at the conclusion of the performance. This act has long been rumored to be part of the impetus for Townsend's hearing loss. The incident also imbedded a rogue piece of cymbal shrapnel into Moon's arm. As far as I know there is no other footage that exists of the kit in action, although there are a number of photographs. Mirroring the personality and abilities of its owner and creator, Keith Moon's 'Pictures of Lily' drum set is not only one of the most recognizable in rock history but an instrument completely representative of its manipulator. 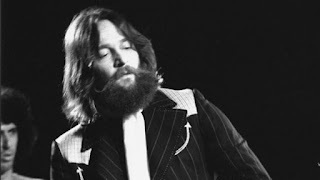 Moon was a drummer who hated solos but who's playing could often be interpreted as a 'lead' instrument. The 'Lily' kit offered Moon a spotlight piece to not only illuminate his talent but express his artfulness and aggression. Thank you for the additional comments! Thank you for reading!